As an English teacher, I don’t have the greatest relationship with math. We used to be friends, but somewhere along the way, math and I grew apart. But over time, we made up, and now, we keep in touch. Which is a good thing because without math, losing weight would be impossible. I mean, all the exercise and eating right in the world wouldn’t help me if I didn’t know how much good my diet and exercise was doing for me. That’s it. If you want to lose weight, that one fact is really all you need to know. All the running, lifting, pushing, pulling, Zumba-ing, and dieting in the world works out because 1 pound will always equal 3,500 calories. That means that for every pound of weight loss you want, you have to create a 3,500 calorie deficit in your body. This deficit can be created through just diet (I lost 30 pounds by switching to low-glycemic foods), through exercise (I lost 50 pounds over last summer by running 20ish miles a week), or through a combination of the two. For example, if you are a soda drinker, you can cut out a single soda each day (which is about 200 calories) and walk maybe 3 miles (which is under the doctor-recommended 10,000 steps a day, by the way). By just doing these two small, easy, and simple things, you will begin to create a 500 calorie deficit each day. Which just happens to be 3,500 calories in 7 days. Which just happens to mean that you will lose 1 pound every week. Weight loss is just a numbers game. If you’re slow and do the math, you will win the game. Fad diets and get-skinny-fast programs try to cheat the system, and they don’t work. And if they do work, they are hard on your body (especially your heart), which means the weight loss is unhealthy. If you keep in mind the simple formula that 1 Pound = 3,500 Calories, you will shed oodles of weight the right way. Guaranteed. It might be slow, and it might not be fun. But it works. Which pretty much sums up this English teacher’s feeling on math in general, too. Life Lesson # 8 – Your Best Diet Buddy? Have You Been Unintentionally Hurting Your Diet? Unfortunately, this completes sidesteps and ignores the fact that not all of the fat you burn goes away. Depending on your exercise regime, a good deal of it can be converted to muscle instead. So you might not actually see a 1lb per week loss, which can be discouraging for some folks. They might even GAIN weight some weeks and not realize that they’re putting on muscle, because it’s still hidden UNDERNEATH the fat. 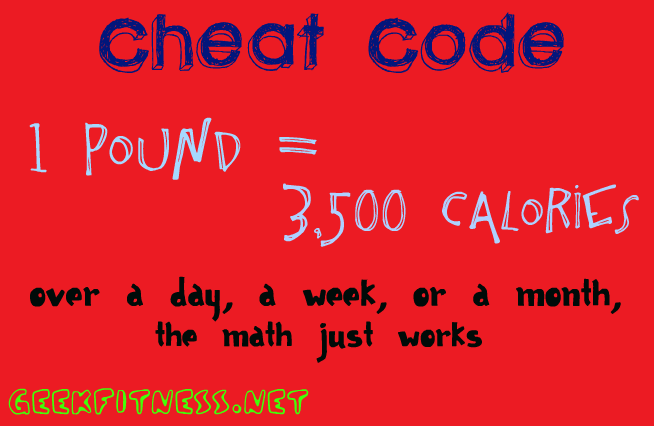 So it’s not as simple as cheat codes and calories in, calories out unfortunately…mafs are HARD. But I still like them. I just prefer to judge my progress by the numbers on my barbell, rather than the numbers on my scale.